These decorative registers from the Steel Crest Basic Series are made of sturdy 18 gauge steel.Choose from 3 decorative designs: Slotted, Square or Tuscan. Decorative registers are offered in 4 colors: white, black, oil rubbed bronze or silver. Our wall air vent covers are available in 17 different sizes to accommodate most duct holes. Decorative registers have a quality powder coat finish that is scratch resistant. The wall air vent covers include matching screws and are manufactured in America. Tip: Decorative registers are sized width by height for the hole you are measuring. 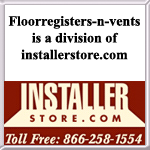 For example, if the interior dimensions of the duct hole measures 8 inches wide by 6 inches high you would order an 8 x 6 register. The faceplate will measure 2 inches larger, example: 10 x 8, on all registers. The pattern will be 3/4 of an inch smaller than stated register size, example: an 8 x 6 register would have pattern dimensions of 7 1/4 x 5 1/4. Important: Wall air vent covers are only for use on walls and ceilings, not floors. Decorative registers are special order, non returnable and cannot be canceled once placed. Once an order has been placed, delivery will take about 2 to 4 weeks. 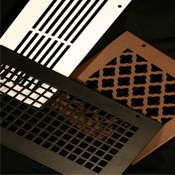 We also have matching wall return grilles and filter grilles for a full set! These wall air vent covers will put a unique spin on your sense of style, call or go online to order today.